Protesters took to the streets of Miami to decry a Dominican ruling that leaves hundreds of thousands of Dominicans of Haitian ancestry stateless. Haitian activists ask why elected officials so far have been quiet on Dominican Republic and hundreds of thousands left stateless. But some members of the community say national and local elected officials have been far too quiet on the issue. Marleine Bastien, executive director of Haitian Women of Miami, said it’s not enough to just have community activists denounce this ruling. "What's happening in the Dominican Republic is an atrocity," she said. "The elected leaders need to speak up." The Dominican Republic amended its constitution a few years ago to ban birthright citizenship, which means you’re not automatically a citizen of the Dominican Republic if you’re born there. Shortly after, the Supreme Court said that amendment applies to anyone born in 1929 or later. That left hundreds of thousands of Dominicans of Haitian ancestry suddenly stateless. The government deadline to apply for legal status was last month. People who did not apply or were rejected face deportation. "This Should Matter To All"
Francesa Menes, who is Haitian-Dominican, was one of hundreds of protesters assembled in front of the Dominican Consulate office in Miami on a recent afternoon chanting, "Dominican-Haitians are Dominicans!" She said she is disappointed at South Florida congressional delegates for not championing the cause of people who are left stateless in the Dominican Republic. "This should matter to all of us," she said. Bastien said the silence has made her question the Haitian community's political clout compared to that of Miami's well established Cuban community. Miami Mayor Tomás Regalado, who is Cuban-American, said South Florida politicians like himself should call out the Dominican Republic for what he said is “a drastic” measure. “We elected officials should be more upfront and condemn what is happening in the Dominican Republic, because what they do to the Haitian community today, they can do it to other communities,” he said. Regalado said he had not spoken about the matter publicly. In New York, Mayor Bill De Blasio recently gave a press conference partly in Spanish, strongly denouncing the Dominican Republic for revoking birthright citizenship to thousands who were born in the country. DeBlasio implied there could be economic consequences for the Dominican Republic if it does not reverse course on this ruling. "It’s unimaginable to me that a lot of Americans, for example, are going to want to travel to the Dominican Republic if this issue is unresolved," he said "And it’s unimaginable that people are going to want to have conferences and conventions." Award-winning Haitian author Edwidge Danticat, who lives in Miami, traveled to New York for that press conference. “I’ve not seen that reaction really from any elected official from his level,” she said. But she’s hoping she will see it in Miami, "If anyone can understand this issue of migration, of expulsion, of refugee and asylum seeking it’s… Miami." 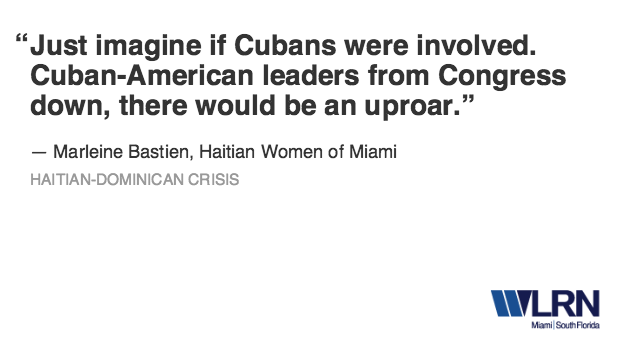 Bastien of Haitian Women of Miami added, this isn’t just an issue for local elected officials to address. With the presidential election ramping up, she said the Haitian-American voting block is paying attention to what the candidates are saying and not saying. "We need to know Hillary Clinton what her position is on this issue. We need to know what Jeb Bush’s position is on this issue,” she said. "You need our votes? We need to know where you stand on this issue." At the recent protest in front of the Dominican consulate office, Miami-Dade Commissioner Jean Monestime talked about a resolution he sponsored condemning the Dominican Republic. Bastien said while the resolution is appreciated it’s mostly symbolic. She and other activists are calling for boycotts against the Dominican Republic and possible sanctions. On Wednesday the Miami Workers Center, a Miami-based social justice group, hosted a standing-room-only community forum about the potential mass deportation of Haitians and Dominicans of Haitian descent from the Dominican Republic. Haitian-rights activists rallied in Little Haiti Thursday morning to decry a Dominican Republic court ruling that strips thousands born in the Dominican Republic of their citizenship. In 2013, the Dominican Constitutional Court passed a ruling retroactively denying citizenship to anyone born after 1929 who doesn’t have one parent of Dominican blood. After public outcry and pressure from the international community, the Dominican Republic passed new legislation allowing people with Dominican birth certificates to regain their citizenship.